A stallion with hereditary equine regional dermal asthenia (HERDA). Hereditary equine regional dermal asthenia (HERDA; “hyperelastosis cutis”) is a disease that occurs early in life in horses, writes Stephen D. White, DVM. Most affected horses are Quarter Horses, but registered Paint Horses and Appaloosas with Quarter Horse lineage have been afflicted with this disease. Many of the Quarter Horses are from high-quality cutting lines. The disease (or something very similar) has also been reported in a cross-bred Arabian mare, a Thoroughbred gelding, a Hanoverian foal, and a Haflinger horse. The working hypothesis is that these horses have a defect in their collagen fibers or in the way those fibers are structurally organized in the mid to deep dermis. Typically, these areas are over the back and sides of the neck. The skin in these areas may seem to be easily torn or stretched, and it often develops seromas and hematomas (“blisters” filled with either serum or blood). Healing per se is usually adequate but often leaves rather unsightly scars. Dorsum of filly with HERDA. Diagnosis is often based on the clinical signs alone; histologic findings are sometimes subtle, but “clumped” or poorly organized collagen fibers below the level of the hair follicles may be seen. A zone of mid to deep-dermal separation has been reported in two horses, and it has been present in some of the biopsy samples that the author has seen. “Poorly oriented” collagen fibers are sometimes seen on electron microscopy. There is no blood test to confirm the disease. This condition is almost certainly present at birth; however, it is often not noticed until about two years of age when horses start being trained with tack, and the friction/trauma of this induces the typical lesions. This disease follows an autosomal recessive mode of inheritance; therefore, for the foal to be affected, both the sire and the dam must carry the gene, and if they were bred again, there would be about a 25% chance that the next foal would also be affected. Obviously, clinically affected horses with the disease should be removed from breeding programmes. There is now a diagnostic test for HERDA developed by researchers at the University of California, Davis. • This article was part of an address by Stephen D. White, DVM, Diplomate ACVD, on equine dermatology at the 2006 AAEP Convention. It was first published on Horsetalk.co.nz in May, 2007. Hardy MH, Fisher KR, Vrablic OE et al. An inherited connective tissue disease in the horse. Lab Invest 1988;59:253– 262. White SD, Affolter V, Bannasch DL, et al. Hereditary equine regional dermal asthenia (HERDA; ‘Hyperelastosis cutis’) in 50 horses: clinical, histologic and immunohistologic findings. Vet Dermatol 2004;15:207–217. Solomons B. Equine cutis hyperelastica. Equine Vet J 1984;16:541–542. Gunson DE, Halliwell RE, Minor RR. Dermal collagen degradation and phagocytosis. 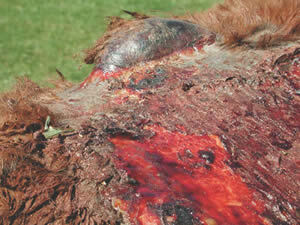 Occurrence in a horse with hyperextensible fragile skin. Arch Dermatol 1984;120:599–604. Witzig P, Suter M, Wild P, et al. Dermatosparaxis in a foal and a cow.a rare disease? Schweiz Arch Tierheilkd 1984; 126:589–596. Scott DW, Miller WH Jr. Equine dermatology. St. Louis: W.B. Saunders, 2003;640. Brounts SH, Rashmir-Raven AM, Black SS. Zonal dermal separation: a distinctive histopathological lesion associated with hyperelastosis cutis in a Quarter Horse. Vet Dermatol 2001;12:219–221. Question? Is the HERDA test 100% conclusive? or have there been faslse neg/pos, and if so? At what rate? ?